Oh that does look yummy! I can eat half a watermelon myself...of course I blow up like one after and wish I had not eaten so much lol, but who can resist watermelon on a warm day? Yummy!! 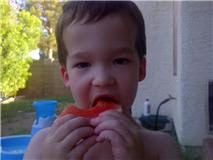 My little one loves watermelon, too!